Our Men & Ladies Fashion store is located in Lounge 1 of Amsterdam Airport Schiphol. Our Leather & Travel store is located in Lounge 1 of Amsterdam Airport Schiphol. Our Business Fashion store is located in Lounges 1 of Amsterdam Airport Schiphol. Our Hugo Boss store is located in Lounge 1 of Amsterdam Airport Schiphol. One of our two The Fashion Gallery stores is located in Lounge 2 of Amsterdam Airport Schiphol. Our Gucci store is located in Lounge 2 of Amsterdam Airport Schiphol. One of our two Burberry stores is located in Lounge 2 of Amsterdam Airport Schiphol. Our Bottega Veneta store is located in Lounge 2 of Amsterdam Airport Schiphol. Our Hermes store is located in Lounge 2 of Amsterdam Airport Schiphol. Our Leather & Travel store is located in Lounge 3 of Amsterdam Airport Schiphol. One of our two Burberry stores is located in Lounge 3 of Amsterdam Airport Schiphol. One of our two The Fashion Gallery stores is located in Lounge 3 of Amsterdam Airport Schiphol. One of our four Victoria’s Secret Beauty & Accessories stores is located in Lounge 3 of Amsterdam Airport Schiphol. One of our four Victoria’s Secret Beauty & Accessories stores is located at Schiphol Plaza of Amsterdam Airport Schiphol. 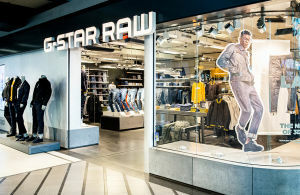 Our G-Star Raw store is located at Schiphol Plaza of Amsterdam Airport Schiphol.